(adj) Superlative degree of huge: big grin, huge grin, makulu grin, Mankele grin. He had a Mankele grin on his face after they avalanched downhill. (interj) An exclamation of extacy, usually after a specifically technical or fast piece of singletrack. 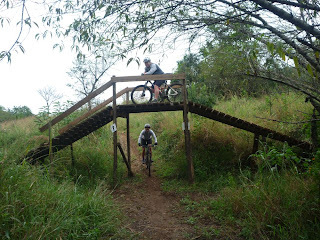 Mankele, but that was a good ride! The first time I experienced the Mankele-grin was after the inaugural Mankele-Sudwala marathon way back in 2007. Afterwards I vowed to go back there to explore at leasure. Years later I criss-crossed the tracks on foot, this time during an adventure race. The morning after the adventure race (while all other sensible adventurers were sleeping or recovering) team Lickety Split explored the singletracks. Again I vowed to go back to explore at leasure. When Team Clueless finished the 3 Towers and experienced the Mankele-grin again on all the faces around us, we knew it was time to share the Mankele Secret. Quick-quick we identified a few friends, a weekend, a campsite and a menu. Game On. The first few car-loads of people and bikes arrived on Thursday evening before the Reconciliation long weekend. They pitched tents in rain while the left-behinders frantically baked last-minute muffins. On Friday morning the early-arrivers tested their bikes on the orange tracks while waiting for the last carloads of people and bikes. The weekend followed a pattern exploring different coloured bike routes, lazing around in the sun around the swimming pool, eating, tubing and more singletracking. The camping kitchen is well-equipped with kettles, stoves, a fridge, a microwave, sunlight liquid and basins. The bathrooms are kept clean and we had no issues with hot water. There's 2 swimming pools, a small shop, powerwash for dirty bikes and outside hot showers if you'd prefer to shower with your bike after a particularly muddy ride. Orange - I didn't get to do the full route this time, but it's the cross country track and sufficiently technical without being too intimidating. About 8 km of good fun. Includes a climb to get the heart rate up. Green - A fair amount of climbing with some excellent rewards through the bushtunnels. The stuff Mankele is famous for, and the reason why we went there. Blue - Around 5 km of moderate tracks, with optional techincal loops. An excellent track for night-riding, albeit a bit short. Add a bit of pink to up the night-distance. Pink - Don't be fooled by the short distance. It includes a decent climbie and some seriously cool flowing singletrack. Red & Purple - I didn't get to ride these the weekend, but from the grins on Mummy Man, Nadine & Donovans' faces, it was some good riding. Black - The best parts, but not for beginners, and possibly not for night-riding. The hardtail managed, but it probably would have been a bit quicker (and safer) to tackle those trails on the Trance. Fourcross-track and kiddies track: great for riding with the kids, night-riding, testing other peoples' bikes, and adding a bit of distance and smileage. Tubing - Tubes are included in the camping fee; collect them from Christopher at the gate. Make sure he pumps them. Small (slighlty deflated) tubes seem to be quicker on the river than the big ones. Remember to lift your bum in the rapids! Batteries properly recharged. Life is too short to not have a Mankele weekend every now and again!